I used to take Lily swimming all the time when she was a baby. It was around when she turned a year old that she started to hate the swimming pool and the pool we was going to was always really cold. So... we stopped going. If you are a reader if my blog you may know that Lily has always hated water, she does not like having a bath, won't put her hands in tubs of water for activities such as bath the baby. She really won't put her feet in the sea when we go to the sea side and so I had lost all hope of doing those fun activities with her. With seeing her improvement with water I decided that it may be time to try swimming again. I found a pool that was only a train ride away that as well as having a toddler pool it also had a little splash pool. This would have gone to nearly knee deep for Lily and so was more like a paddling pool than a swimming pool. Perfect for her introduction back to swimming. She was a little unsure at first, and wasn't liking that her bum was getting wet as she slid down the slide, but as soon as she had gotten over the fact that she was going to get wet, she loved playing there. I did try her in the toddler pool. She was quite happy lead on a float on her front as I pulled her around. But without the float and even though she was wearing arm bands, she gripped to me for dear life. I did let go of her right at the end to show her that she could float, but her mouth dipped slightly under the water and after a mouthful of pool water it was game over and she wanted to go home. But I must say that it was a really successful first trip to the pool. She said she enjoyed herself and she says she would like to go back. I am definetly going to try and make it a more regular thing. Do your children enjoy swimming? What age were they comfortable with the pool? All the children enjoy swimming. They were taken to local swimming pool from a young age, and. I believe became comfortable being in the water through being allowed to play, be with trusted adults, etc. I suppose us adults being swimmers and enjoying being in the pool, maybe gradually instilled confidence in the children through shared experience/s at the swimming pool. Though there being a small paddling pool probably a great help, a great bonus for the children when very young. My daughter took some time getting used to the idea of being in the water. 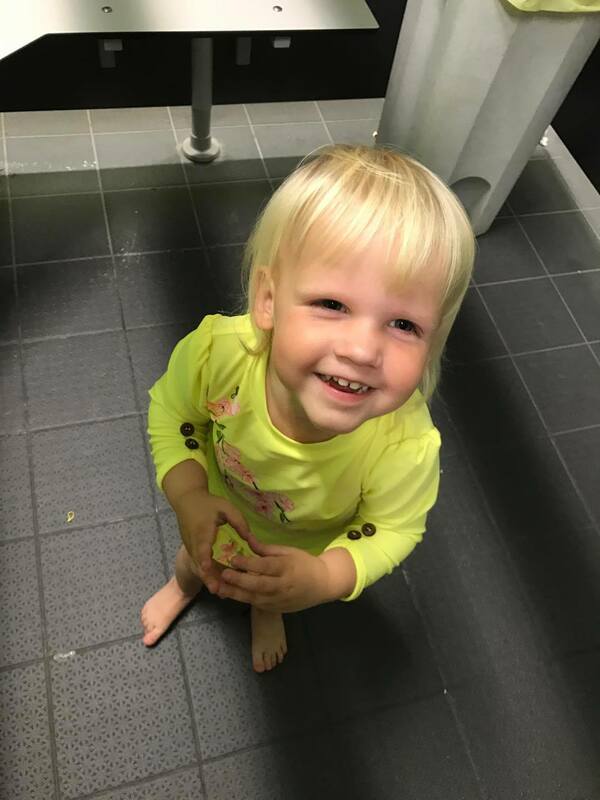 We ended up having an experience in a pool on holiday that helped her get a bit better with it before starting her with swimming lessons with my husband. She's nearly 5 and takes swimming lessons on her own, but she's still not at all confident with the idea of going under water. I know it will happen when she's ready. Sounds like a very good start. Hopefully she'll continue to enjoy it. It is really great that she got back into it. Lily looks so Happy in the photo.